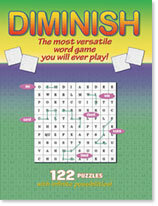 Diminish is the most versatile word game you will ever play. It is suitable for players of any age or ability level. The game consists of a 10 by 10 grid filled with random letters in the same frequency as they occur in English words. The object of the game is to find as many words on the grid as possible by combining adjacent letters in any direction: up, down, left, right, backward, forward, or diagonal. Once a letter is used, it cannot be used again, so as the puzzle is solved, the number of available letters diminishes. Created by a research psychologist, Diminish promotes word recognition, involves strategic planning, and lets students of different abilities compete with one another or work independently. Diminish Puzzle book contains 122 unique puzzles that can be copied and used over and over as a fun classroom supplement.